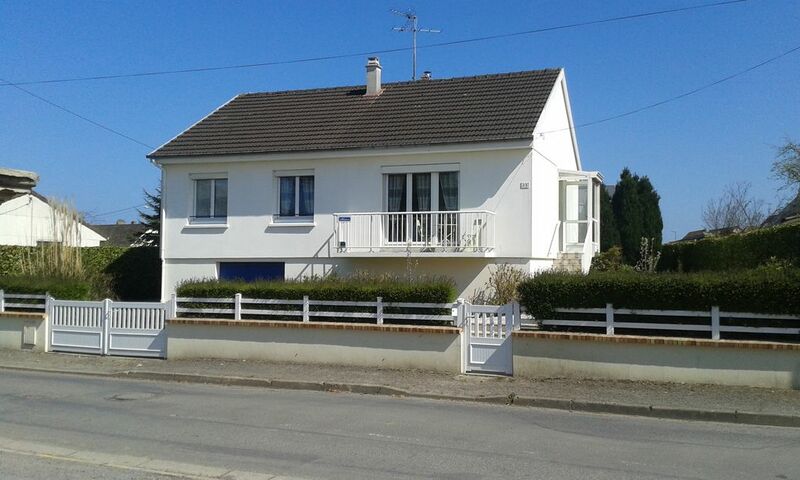 a magnificent cottage, two steps away from the D-Day sites. Have a freedom scented holiday. We are open all year round. A Marée Hôtes Is a furnished all comfort bed and breakfast rated with 3 stars by Etoiles de France and labelled 3 keys Clévacances. A Marée Hôtes can accommodate 4 to 6 people and was carefully laid out to allow you spending pleasant holidays. Here, the town life is quick replaced with relaxation and rest. Located between land and sea, A Marée Hôtes has an iodized perfume; it is a place where you will enjoy beautiful evenings and watch, from the terrace or balcony, beautiful sunsets. A place where you will be able to sleep under the apple tree and watch your children play on the garden in total safety. A place just minutes away from the harbour, where you can attend the mooring of fishing boats, or walk through the countryside by taking the small lane located right to the left of the house. We were born and raised here, it this small area in Normandy: Le Bessin. We spent our years of professional, nearly 40 years, in Paris, where we were able to know people from the sports and twinning environments: catering, entertaining sharing and transmitting are normal activities for us. We had a dream of renting cottages and we made it true some months ago when we bought a big house surrounded by a large terrain, with an indoor swimming pool, just minutes from Grandcamp-Maisy, where we have also opened a cottage: Au pré verger A marée hôtes used to be our seasonal home. We used to come here to revitalise. We have carefully refurbished it for you to have a nice holiday. A marée hôtes is a lovely and sunny house. The fenced garden you allow you to spend good times with your family in total safety. Pets are welcome. Located a few steps away from the Grandcamp-Maisy fishing harbour and the beach, close to the shops. A Marée Hôtes has an iodized perfume; ideal to revitalise. We were given a very warm welcome by Liliane upon arrival to the house. The house is very well presented, being clean, comfortable and very well equipped. Excellent wi-fi. It is ideally situated in a small harbour town with all amenities and excellent markets and is within easy walking distance of an excellent supermarket. Grandcamp Maisy is an excellent location if you wish to visit the D-Day landing beaches and memorials and beautiful surrounding countryside. Booking was easy and communication with Liliane was excellent. It was an absolute pleasure to return to this beautiful house each day. A notre arrivée, Liliane nous a accueillis très chaleureusement. La maison est très bien présentée, propre, confortable et très bien équipée. WiFi excellent. Le gîte est idéalement situé dans une petite ville portuaire avec tous les agréments et des marchés excellents et est facilement accessible à pied d'un supermarché excellent. Grandcamp Maisy est un emplacement excellent si vous voulez visiter le Jour J posant des côtes et des mémoriaux et la belle campagne environnante. La réservation était facile et la communication avec Liliane était excellente. C'était un plaisir absolu de retourner à cette belle maison chaque jour. Nous ne pouvons pas concevoir cette activité si la qualité de l'accueil et du gîte ne sont pas excellents. A la lecture des appréciations, il semble que cet objectif soit atteint. Very clean well appointed cottage. Walking distance from all amenities restaurants bars harbour and carrefore. Easy drive to war landing sites, Bayeaux and much more. The cottage was very expensive especially with all the add ons. For this price we would expect a lot more such as a welcome pack, English TV, and soap in the bathroom. Despite the owners assurance it was impossible to connect wi fi. - Ménage de fin de séjour a été choisie par les locataires à leur arrivée. L'option linge de toilette n'avait pas été retenue mais les locataires ont néanmoins utilisé celui stocké dans l'armoire (coût 16€). L'option linge de cuisine avait été offerte (8€). Des produits et savon liquide étaient à disposition. Sur la table du salon, en cadeau de bienvenue, une bonbonnière de caramels (produit régional) n'a pas été dégustée. A leur arrivée, les locataires ont exigé que la maison soit chauffée. Après rappel de la réglementation française autorisant le chauffage du 15 octobre au 15 avril, et malgré la présence d'un radiateur d'appoint, la chaudière a été remise en route ce qui a nécessité un temps de chauffe. Les loctataires ont exigé un contrôle de chaque radiateur le lendemain matin ce qui a été fait. Le WIFI pour lequel il n'est pas fait d'ordinaire de remarque particulière, était en état de marche. Il n'est pas précisé dans l'annonce l'accès à une chaîne anglaise. The supplied services concerning our holiday cottage of the certified seaside three keys were the ones described on the site Abitel and which appeared on the rental agreement validated by the tenants, worth knowing: - price list averages season - linen of supplied bed - tourist tax a person and a night The proposed options: - household of the end of stay was chosen by the tenants upon their arrival. The option bathroom linen had not been held but the tenants nevertheless used that stored in the cupboard. The option linen of kitchen (cloths, 8€) had been offered. Products and liquid soap are at arrangement. Upon their arrival, the tenants required that the house is warmed. After reminder of the French regulations authorizing the heating from October 15th till April 15th, and in spite of the presence of an extra heater, the boiler was restarting what required a time before the desired heat settles down. The latter required a control of every radiator the following morning what was made. Liliane was a lovely host and the cottage was perfect for our family's recent stay in Normandy. It is a short walk to the water, with its wonderful daily fish market. There is a grocery store and several restaurants nearby as well. We made day trips to D-Day sites and also Mont St. Michel. The cottage was spacious with plenty of room for two adults and our three children. The small kitchen was well stocked with everything we needed to cook at home. The town is very peaceful and Liliane's garden is beautiful too. We would definitely recommend this location to anyone staying in the area. We had a great stay at the cottage. The location and facilities were excellent and great hosts in Liliane and her husband. Very helpful and genuine nice people. Time went too quick at this fantastic place. A fantastic stay and a fantastic host! We had a fantastic time in Grandcamp-Maisy, and a great stay at the cottage. It was exactly as described in the listing, and an easy walk to town to enjoy the port and all the restaurants. It's also right in the middle of all the main sights/sites of Normandy and was the perfect location for us to base ourselves. The house has all the amenities, including fast wi-fi, and a beautiful garden. Liliane and her husband are wonderful and went above and beyond the call of duty, helping us with a few hiccups due to the airline and generally being the perfect property owners and hosts. We couldn't have asked for anything more, and recommend this place dearly. Merci bien!!! This vacation home was the perfect base for all things war related. You are in the middle of a very sweet town with awesome bakeries and very friendly people. Our kids loved the fresh fish market. The house was nice, clean, and exactly what we needed during our weekend trip. The backyard was wonderful. We could relax and play after a full day of sightseeing. Liliane was very respectful and welcoming, even after we showed up three hours late due to traffic in France on a state holiday! I would recommend this property. Marée haute était notre résidence secondaire, un lieu où nous aimions nous ressourcer le temps d'un week-end ou de vacances. Nous l'avons pensée et aménagée avec soin afin que chacun, ici, petits et grands, puisse aussi profiter pleinement de cet endroit au parfum d'iode, situé à quelques pas du port de pêche et de la plage, et à quelques kilomètres seulement des sites historiques de la bataille de Normandie. Perfectly located on the Norman Coast, in the heart of the Bessin and close to the Cotentin peninsula. 250m away from the fishing harbour of Grandcamp-Maisy, along the circuit of the landing beaches, Omaha and Utah beaches, going through Pointe du Hoc. Our cottage is surrounded by a wooded garden with flowers, perfect for relaxation. At high tide is the perfect place to revitalise and discover this genuine and picturesque fishing village among a preserved nature and heritage. The young and the not-so-young, the history lovers, the stone houses lovers, the leisure and discovery activity lovers, the nature, sun and sea lovers, nautical sports and horse riding enthusiasts, there is something for everyone in Normandy. In spring: Many hiking paths that border the coast and cross the countryside allows you to enjoy nature arousing when the hillside gets covered by little yellow flowers named Primula, or when the hawthorn gets covered by strongly scented white and pink flowers. Book now your stay in Normandy in June 2014 to celebrate the 70th anniversary of the recovery of freedom. In summer: Ideal for fishing activities, on the sea or on the land. Grandcamp-Maisy welcomes, at the high tides season, many shrimp fishermen! Book now your stay for August 2014 if you want to see the World Equitation Games that will take place in Normandy, at the St. Lo farm in particular. In autumn: Ideal for strolling and enjoying the last days before winter. You can visit many historical sites (castles, mansions, museums, and more) that make Le Bessin famous. A little bonus: Free use of the indoor heated pool, located just 10 minutes away on the owner's house, in the orchard. In winter: discover the marshland when the river overflows, invading the nearby swamps. - Participate at the Coquille St. Jacques festival in Grandcamp-Maisy, December 7 and 8 2013. - Spend the New Year celebrations with your family on the seashore: A Marée Hôtes gets covered with the Christmas colours! Come taste the many products that make Normandy famous (fish and shellfish from the fish market fresh and traditional). From there, why not going to explore on foot the picturesque Chausey Island or again for a step in the Anglo-Norman Islands?